The competitive juices must be flowing, because there’s a new example of government stupidity from the United Kingdom that is hard to believe. 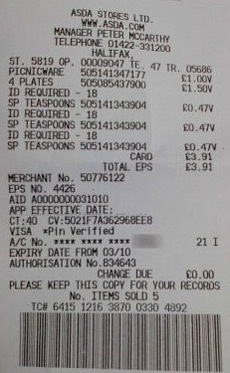 As reported by the Register, you now need an ID to buy teaspoons. Are you under 18 years of age? Do you have an urgent need for teaspoons? Well, avoid Asda’s Halifax tentacle where the powers that be are determined to prevent this potentially-lethal item of cutlery falling into the hands of murderous yoof. …According to the background info, the lady shopper in question was told by an Asda assistant that she’d have to prove her age “because someone had murdered someone with a teaspoon, and therefore ID was now required”. Actually, I suppose I’m being unfair to blame the public sector for this nonsense. The story doesn’t actually say this is a government-imposed policy. So perhaps the store inexplicably decided to antagonize customers and hinder commerce with this new requirement. But if that’s the case, I’ll still blame government because the store manager doubtlessly was (mal)educated at a government school. Some American readers may be feeling a bit gloomy at this point. After all, how can politicians and bureaucrats in the United States possibly match the stupidity of their cousins on the other side of the Atlantic? Well, don’t be depressed. America still has a strong claim to the top position in this contest about government incompetence. After all, cops in Indiana arrested a grandmother for buying cold medicine for her husband and then (gasp!) buying cold medicine for her daughter before the end of the seven-day waiting period. Dd..d..do I need id to but toothpicks? @Joe: The goal is not to make such items illegal. The goal is to make someone legally liable for every bad thing that happens so that lawsuits can increase at an ever increasing rate and lawyers can increase their wealth at an ever increasing rate. The only problem with that line of reasoning is the sheer number of items that can be used as lethal weapons in the hands of someone determined to kill or deliver grievous harm to someone else. If you follow that argument to it’s ultimate conclusion then it becomes illegal to sell anything to anyone because of the potential of harm to someone else. That’s not a spoon. This is a spoon. It’s always amusing to see Formerly Great Britain sink further into the quicksand. It’s less so to watch us follow. This is not a problem with government policy, per se, but a problem with the legal system. The store’s lawyers have told them that, because somebody once killed someone with a teaspoon, if the store knowingly sells one of these dangerous weapons to a minor, the store could easily be sued for providing a weapon to the minor child if the minor child injures someone with the spoon. The extension of legal liability to stores that sell legitimate products is more about the greed of lawyers and the abuse of the legal system than anything else. Of course, if I’m not mistaken, the U.K. has some version of loser pays, so such law suits should be less frequent. I could be wrong.